How A New Service Saves Time Downloading Documents! HomeService ProvidersHow A New Service Saves Time Downloading Documents! We are becoming more and more of a paperless society as each day goes buy. But who’s really pushing this? Believe it or not, its not you or I.It’s the big companies and their interest is not in saving the environment! It’s in saving costs associated with not having to print your bills, bank statements and other documents and sending them through the postal mail system. Instead you are sent an Email saying your bill is ready. The problem is that instead of running outside to the mailbox, you have to login to their website to view and download the bill. Not only do you have usernames and passwords to contend with, but you’re not really saving any time and maybe spending more time and that’s not Working Smart!. Not only that but your bills and statements are all over the place and keeping track of all those websites is starting to become a nightmare for some people unless you use a Password Manager such as LastPass. 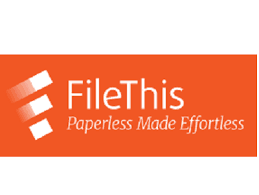 If you’re like me and have embraced some sort of Electronic Filing System as described in last year’s articles titled “The Electronic Filing Cabinet”, chances are you could save time or even not have to spend any time login in to your online accounts to download bills and statements thanks to a new cool service called FileThis. FileThis allows you to setup a automatically login to your online accounts. 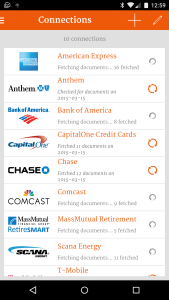 Then it securely fetches all your online statements, bills and other documents from companies like American Express, Bank Of America, Chase, Anthem, Amazon, T-Mobile and many more without you having to login to their sites individually. The service works by you first creating an account on their website and set up your connections to your financial institutions or utility companies. Then you set up a destination for your documents to go to. 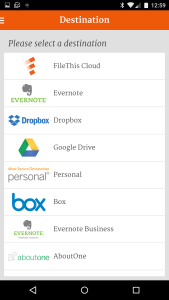 The destination can be a cloud service such as Google Drive, Amazon cloud Drive, Dropbox or Evernote. Or you can download a small program to run in the background on your PC hard drive and have your documents automatically downloaded when fetched. If you don’t have or don’t want to use any of the destinations they have to offer, you can simply login in to there WebSite and opt to use the FileThis Cloud service to view and download your documents in PDF format. Whichever destination you use, FileThis have worked hard with their destination partners to ensure your files are stored in an logical order making them easy for you to find regardless of which destination you have chosen. 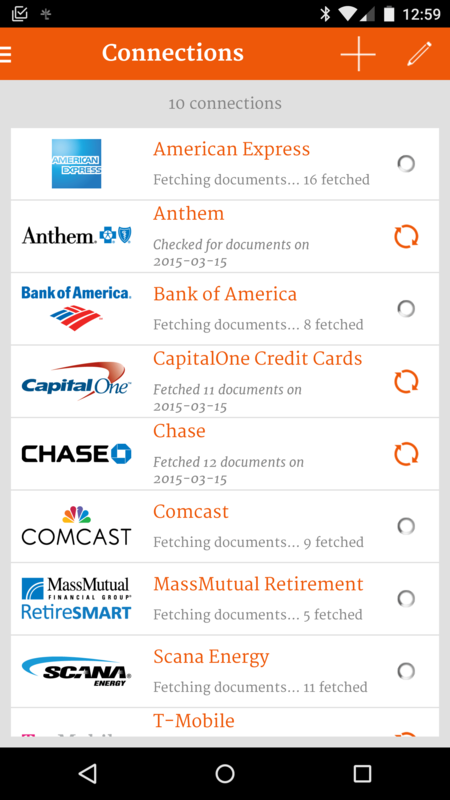 Furthermore, you can use their phone application to access your account and view or download documents as well. On the security side of things, they encrypt communication so no matter what device you use, your desktop browser or your mobile phone, your data is always sent using 256-bit SSL encryption, the highest standard communication security currently available today. So nobody can ever see or steal your data as it is transmitted to or from your FileThis account. 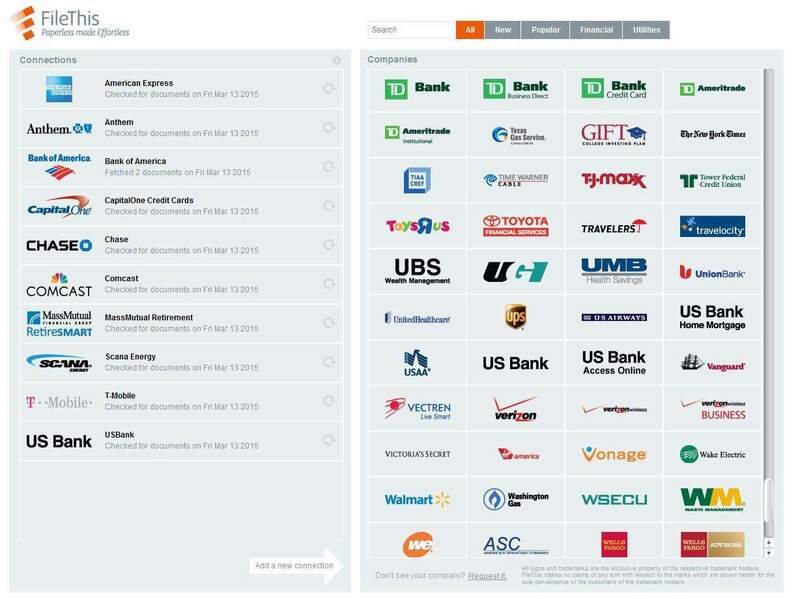 Your connections to your bank and utility companies are also encrypted from the moment they are entered utilizing AES 256-bit encryption and data sent to and from your connections is encrypted also using 256-bit SSL encryption. 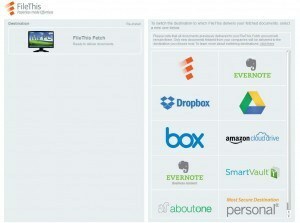 FileThis has three pricing plans to choose from. Forever Free (the free plan) will give you up to 6 connections and will check once a week for documents. The Forever Free plan is a great plan for testing the service. After signup, you can upgrade to the Premium plan for $2 per month giving you 12 connections and that runs once a week or the Ultimate plan for $5 per month for up to 30 connections and checks for new documents daily. Discounts are given for paying for a whole year in advanced. 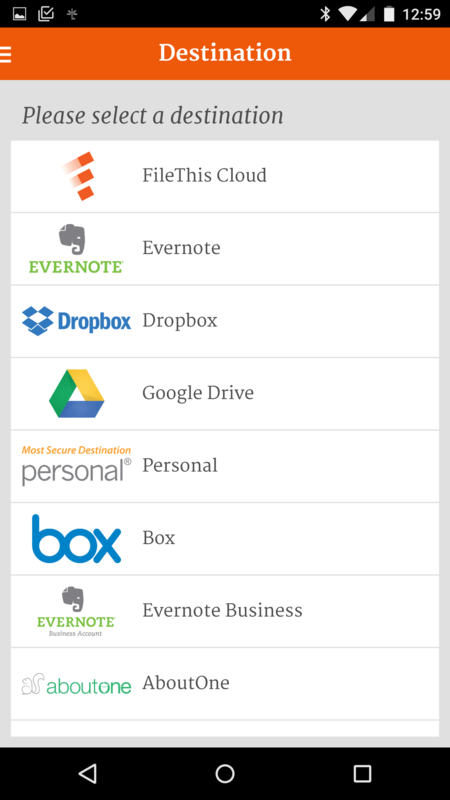 Depending on which plan you are on, you have different storage allotments on the FileThis Cloud. With Forever Free you have 500 MB of Storage, with Premium you have 1 GB and with Ultimate you have 10GB of storage. If you use the Forever Free plan, unlike most companies or websites, you don’t see any of those annoying advertisements when you are using their service. 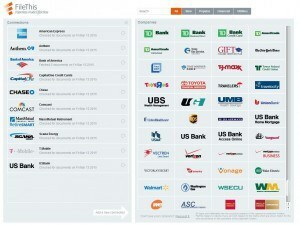 At the time of this writing, FileThis have a little over 300 connections to Banks, Utility Companies and other institutions. I have been using the service since September of last year and it’s proven to be a very nice time-saving service for me. I use the service in connection with SugarSync (an automatic synchronization and backup service) and Earth Class Mail (a virtual PO Box). 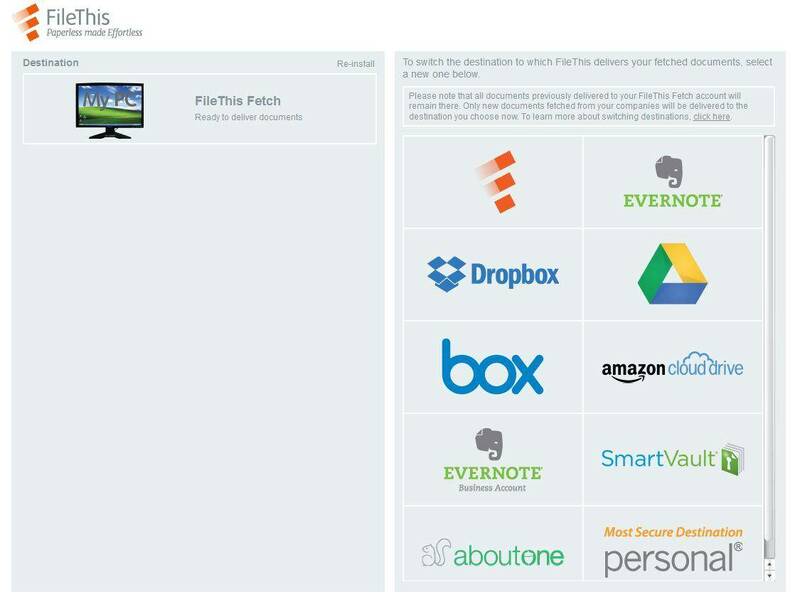 By using FileThis’s small download program, my automatically fetched documents and stored in a folder I have synchronized with my LapTop. This works very well for me and all I need to do is check my fetched documents folder when I receive an email from FileThis. If the files are simple bank statements, I just read through them using my PDF reader them file in the relevant folder on my hard drive. If it’s a Bill, I pay it online then file it in the relevant folder. I no longer have to login to the individual accounts I have set up with FileThis making the service a huge time saver for me and that’s Working Smart.